So I understand that this blog is supposed to be about my bus and my travels in him. And I realize that the last bunch of posts have had nothing to do with the bus. I'm taking a break from the MGB front end rebuild set of posts to hit a couple bus-related ones (pause for applause). 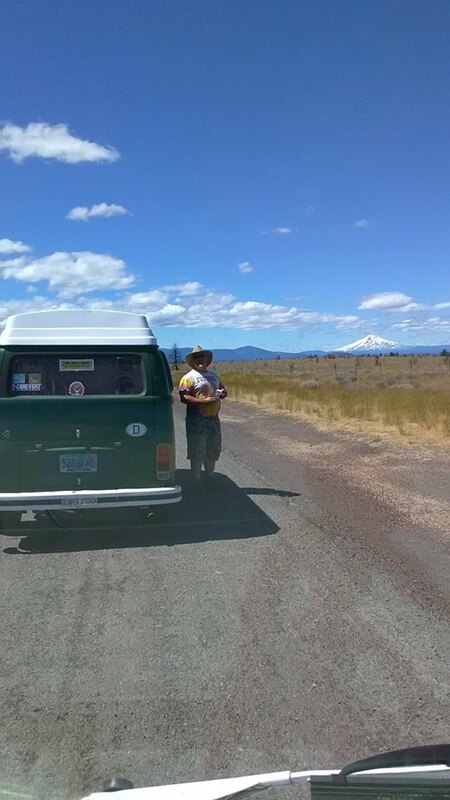 For starters, I'm starting with a classic road report, detailing our annual trip to Bend for the 4Peaks music festival with our good friend Grateful Ed in his trusty '73 VW Riviera Poptop, Belle. In prior years, I've used a local music festival as a way to knock the kinks out of the systems before taking the 4-hour drive to Bend for 4Peaks. Since the Hootenanny isn't held anymore, I don't have that built-in system. So, my road-ready testing isn't quite as, uh.. exhaustive. I made sure Hapy could start, he was clean and empty of not-camping stuff. I verified his oil and coolant levels were right. He was ready enough to drive around town, I figured. I did replace the front door seals, though. I remembered from the year before how cold the bus was on the drive because the seals were gone. I bought the really nice grey ones through CIP1, replacing the black Brasil-sourced ones I had been wrestling with for years. About a week before we were supposed to leave, I fired up Hapy and drove to the corner fueling station to fill it up. I took Boo and K2 with me, and thought I'd show off just how much better Hapy's off-the-line acceleration is. Well... he wasn't as snappy as he was before I ran him out of fuel, but he left the stop line pretty quickly. We got to the gas station, and got the diesel flowing while I washed the windshield a couple of times. Once filled, I turned the key... and nothing. 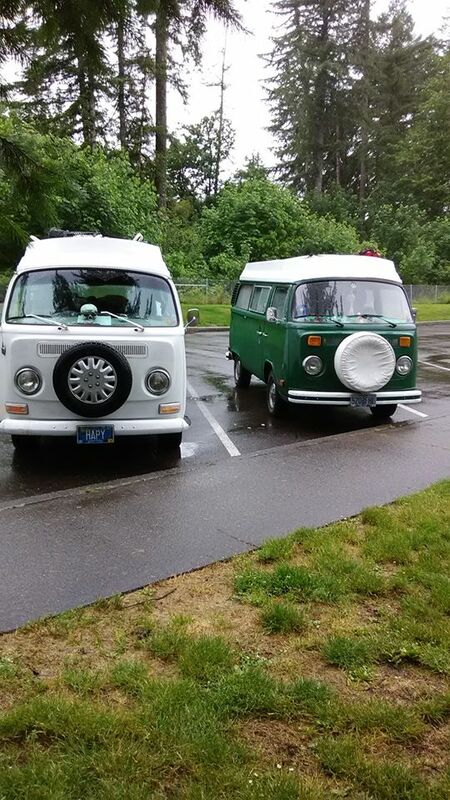 I figured I did something electrical, so we pushed the bus into a parking space. Boo and K2 walked home for another car to give me a jump while I started diagnosing things. I was fully stymied until Boo got back and we started with her at the wheel trying the key while I wiggled wires and re-set relays. I went to the battery and was messing with the thick cables and Hapy started acting like he had the right voltages. During my efforts, I moved the battery ever-so-slightly forward, and then Hapy fired right up like nothing happened. I remembered that the battery sliding back into the rear tail light housing causes this problem for some reason. Grr.. I really need to solve that permanently. After that, Hapy drove great the rest of the week. I didn't try to show off his acceleration again, nor did I really stress him, but I got him up to temperature, and puttered around town. The night before we left, Boo accepted a new job. In order to keep things moving forward, she needed to fill out a bunch of paperwork and take a pee test before we left town. So, we fit all that around our exit. We had initially intended to meet Ed at his place south of Portland around 10AM, but we ended up leaving closer to 11:30. We were still well out of heavy traffic periods and headed south on I-5 towards Salem. With Belle leading, Hapy drove great. His temps stayed down, and it wasn't long before we had turned onto OR-22 heading east off the plain and into the forest. Belle was driving without windshield wipers, but the Rain-X was pushing the sprinkles out of Ed's line of sight. 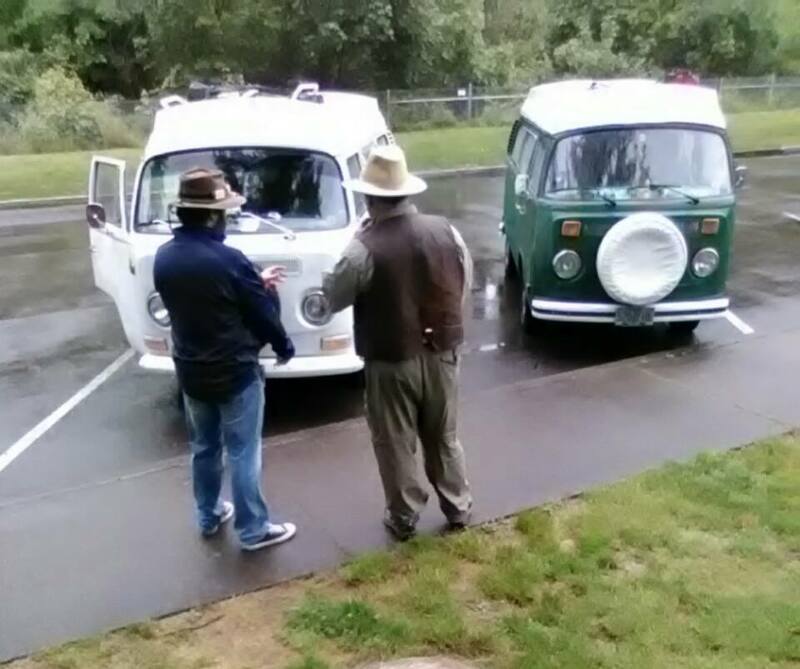 We visited the Maples Rest Area in Gates, checked Belle's oil and took a brief break. 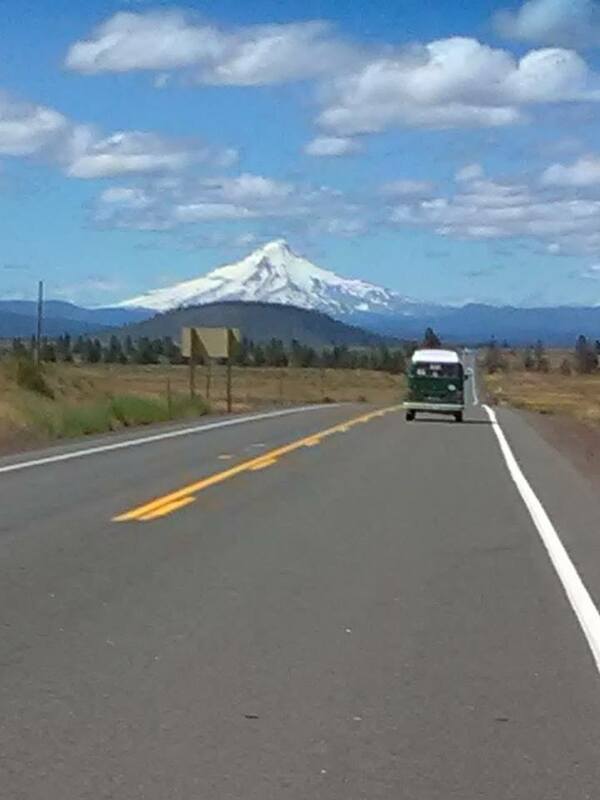 It was after we passed through Idanha that Hapy started to have speed issues. I wasn't able to get the throttle to respond on hills. While it wasn't a huge deal, it started to weigh on me as we worked our way up and down and up and down through the Cascades and over the Santiam Pass on US20. Still, the drive was beautiful and the new front door seals really held out the cold draft and rain. The little heater produced a little heat, so while Boo had a blanket on her lap, I was perfectly comfortable in little more than a jerga. We hit Sisters before 3, and we were feeling really good about our progress. For the first time I can remember, we made it from end-to-end through Sisters without coming to a complete stop. The venue for 4Peaks was moved this year. Until this year, it was held in Tumalo, NorthWest of Bend at the Rockin A Ranch. This year, it was held South and East of Bend at Stevenson's Ranch so we had an extra 10 miles or so to travel, but through the city. We stopped at a gas station near the ranch for Ed to fill Belle with petrol and I got ice. I'll have a separate post about the festival entry, the location, the scene, the people, the music, etc. Suffice to say, it was awesome. We drew the conclusion that the sluggish accelerator pedal was because of gunk getting into the fuel filter when I ran the bus out of fuel. Not having a spare fuel filter (bad bus owner), nor access to a parts store meant I was driving home with a restrictor in my fuel system. We didn't really want to leave, but Ed had to be at work on Monday, and the festival, though open longer than past years, still closed at 4. And, of course, we had a 4 hour drive home to do. While the weather on the way out was a test of our buses against wind and rain, the drive home was a test against a summer solstice sun and desert heat. We left the festival around noon and hit a filling station before doing anything else. Since we had traveled over 200 miles since the no-start fill a week before, I concluded I would need fuel before leaving civilization and entering the central Oregon desert. I bought just over 6-1/2 gallons, recording 32mpg on the drive out plus the around-town driving the week before. Ed joked about how you can't burn too much fuel if you can't get it to your engine. Good one, Ed. We had decided before we left for the festival that we would drive home a different way to change the scenery. After the sluggish hills on the way out, we thought that driving US26 through Government Camp might not have as many ups and downs as US20. We hadn't considered that the US26 route left us in the desert for far longer, and that the temperatures were in the 90's compared to the 50's on the way out. This created a different stress... on the cooling system. The drive north on US97 was steady going. Redmond had some traffic, but Metolius and Madras were mostly unpopulated. Actually, when I consider how large an event is coming to Madras for the total eclipse in August, the town appeared largely for sale. Many store fronts and undeveloped lots had for sale signs on them. That's not a very positive statement for the health of Madras. It is in Madras that we left the US97 for the US26 and our flat uneventful drive changed. The road out of Madras starts with a long uphill pull. Hapy didn't have that lack of acceleration, but his temperatures started to climb. When he reached 195* I pulled over and let him cool back down. More hills, more desert heat and more altitude meant that his temps would rise again, and again. I started letting his temps run up to 202* before pulling over to cool him down. Each time, Ed would pull over with us, or somewhere ahead of us so we could continue our carabus. That is, until finally, we had to let Ed go while we let Hapy cool way down. Boo and I had a roadside picnic in the middle of the Warm Springs Reservation and Hapy's temperature dropped down into the low 170's. Still, it didn't take long before we were climbing again, and his temps were high again. All told, we stopped 6 or 7 times including the picnic stop between Madras and Government Camp. I've mentioned SkiBowl a number of times. I love playing in the snow there. After such a hard climb up the east side of Mt. Hood, Boo and I decided Hapy needed a longer rest, and we could use a beer so we stopped at SkiBowl West. The bar (Beer Stube) isn't open during non-ski season, but the cafe is, and they sell beer in cans, so we split a tallboy on the back porch. As we sat, we could see that there is still snow at the top of upper bowl, even though it was over 85* at the lodge. SkiBowl is in the process of switching over from winter to summer sports, where they leverage their ski lifts to enable mountain bikers the ultimate: a lift to the top so you only have to ride downhill. Although it was Sunday, we only saw 2 cyclists the entire time we were there. We will be back, with as many boys as we can muster, to play on that hill. That's just too fun. The drive from SkiBowl on home was completely non-eventful. The accelerator was responsive and the engine temp never climbed above 192*. I don't know if it was the desert, the higher altitudes or what, but once back on the west side of the Cascades, Hapy drove like a champ. 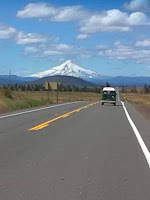 We drove US26 to OR212 through Boring and then connected with I-205 around to I-5 and finally onto OR217 home. He even handled the interstate traffic easily. Still, I need to look at the coolant. I think the coolant / distilled water mixture is off, and that caused the radiator to be unable to manage the engine heat. I haven't filled up since we got home, and I know I need to soon. Overall, Hapy was great. As a camping vessel, he was a pleasure. I'll get into that in another post, but simply as transportation I know I need to do a better job of getting him ready before taking him out of round-town puttering or he'll leave me stranded. And it will be completely my fault. That's it for this time. Thanks, as always, for following along. I'll post about the festival, and a new bus-change I did to improve the camping experience soon.